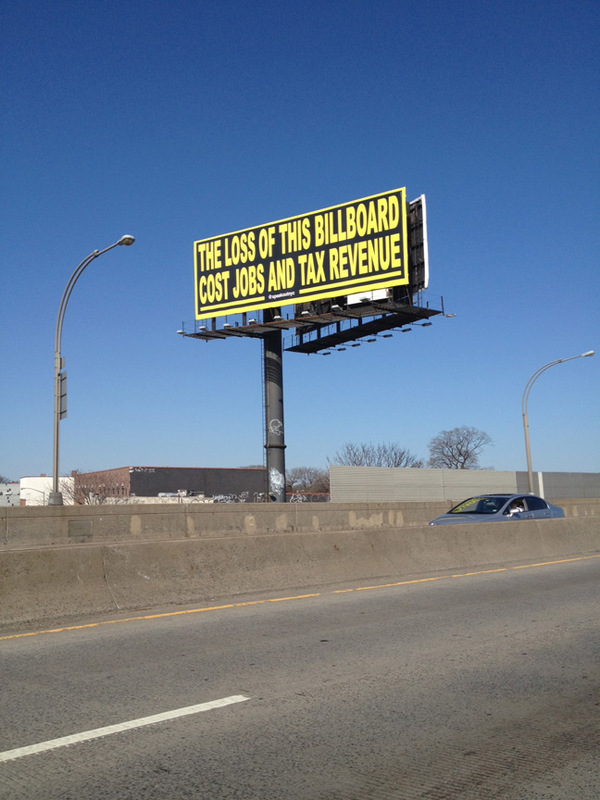 Billboards along the BQE have been under attack by the NYC Dept. of Buildings for some time now because it seems they are almost all illegal. In response, the industry has been self promoting its worth with this sign. I have several responses to this. The first is that the industry came very close to killing someone when an illegal and thus un-inspected sign came down in a wind storm a few months ago. 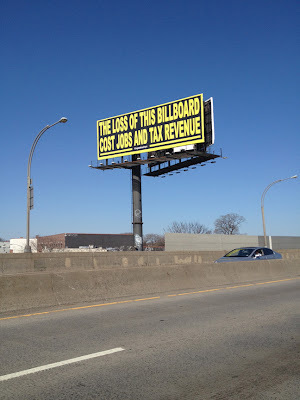 While this billboards removal might result in the loss of a single job, the loss of a life due to the unrelenting greed of the industry in general would be a much more tragic scenario. Second, the outdoor advertising industry is notorious for flouting the law and operating by their own set of rules. If the billboard is illegal I highly doubt that the company is concerned with paying the city its due for the erection of this sign. Whining about the loss of tax revenue is the last thing I think anyone is concerned about. And last but not least, the loss of this billboard would have many positive effects including the raising of local property values, benefits to our collective mental health and potentially an increase in extrinsic social behaviors for those now under the signs influence. When weighed out I don't think the public is all that concerned is some giant multinational is out of a few bucks.